My parents were actually here for the entire month of February, which was great. Abigail got lots of time to spend with her lesser known grandparents and has been discussing it ever since. And naturally, my parents looks at our backyard and immediately noticed the great void where a sandbox should be. Never mind that this void was currently full of grass, clearly that was where the spirit of a sandbox-to-be currently resided. The sandbox itself arrived about a few weeks ago and I put off construction for a week or so, not quite ready for the logistical challenges inherit in not just the building of the sandbox, but also the acquiring of the sand and the preparation of the yard. Frankly, the idea of lugging 50 pound bags of sand around didn’t appeal. And keep in mind, they wet the sand. The 50 pounds is before they put the water in. I’m just saying. When I finally broke out all the pieces and started putting it together, it seemed pretty straightforward. There were step-by-step instructions, with an actual photograph in a diagram, showing you what they meant in each step. Sure, most of those pictures were pretty small, and taken at what looked like an unnecessarily wide angle. And the top level set of instructions were in German, but English got second billing. That couldn’t be bad right. The first step was pretty straightforward, putting together the wood frame base of the sandbox, the pieces interlocking like a log cabin. Work progressed quickly, with only a moderate amount of stomping. The next instruction was to secure two sides of the base by screwing a small piece of wood on each side. The written instructions were very clear: this piece of wood was to be attached the sides that did not have screw holes. The diagram was also clear, showing the piece of wood firmly attached to the side that did have screw holes. They even had a white circle around the errant piece of wood. Now, the diagram also had a tiny insert image that featured the piece of wood in the, presumably correct position, but at this point, the battle for clarity has clearly been lost. After much soul searching, as well as some reading ahead, the small piece of wood was drilled into the side without the screw holes. Things progressed pretty smoothly from there, with the posts for the roof going up and the pulley system going together. Then we arrived at the step that asked me to cut 4 pieces of card board out of the box the sandbox came in. These pieces were to be approximately 5 by 10 centimeters. Naturally, my American educational background served me well here. I quit and came back to finish the sand box a week later. But when I did, and I had carefully measured out the approximate dimensions needed, I found that the instructions didn’t get any better. What, precisely, were these pieces of cardboard for? Clearly they were for spacing things out. Approximately spacing things out. Naturally, these pieces of cardboard were depicted exactly nowhere on the instructions. I thought about this for some time, reading and re-reading the instructions, examining instructions yet to come, and decided that I should shove them in next to the posts that held up the roof. Satisfied that I had this right, I showed my work to Jessica. She looked at the instructions and agreed with my conclusions in exactly no way whatsoever. A brief argument proceeded from this discussion, exactly the sort of argument parents have when these damned instructions don’t make any sense. In the end, we actually used the cardboard both ways. I’m guessing we could have used the cardboard neither way and the results would have been about the same. With the frame set, the posts rising skyward and the roof secured, it was time to approach the pulley system. Because no self-respecting grandparent would buy their granddaughter a sandbox that didn’t have a roof that went up and down on a crank. That would be silly. It was at about this point that I became irritated with the irrational exuberance of the instructions. “Fasten X onto Y using the screws!” Exclamation points have no place in toy construction. Anyway, I got the sandbox was finally complete. It was time to put in the sand. About that. 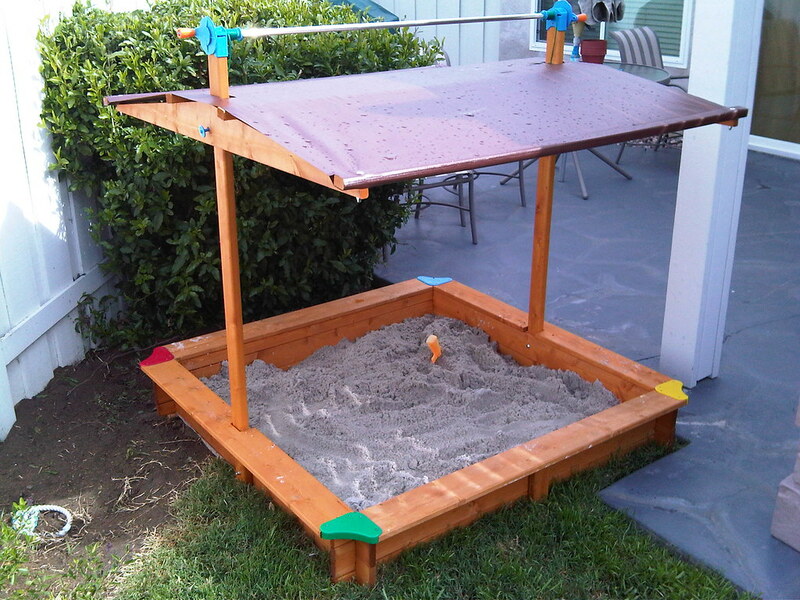 The roof of the sandbox rises to a level of about 4 feet and sticks out to the edge on all sides. You know how they tell you to lift with your knees? I would like to see you do that while trying to empty a 50 pound bag of wet sand into a 4 foot tall sandbox. This part of the project was good for neither my back nor my dignity. But it was worth all the work. Abigail loves it. The cat loves it too, which is why I’m now very glad we have a roof we can close when she’s done. Thank you very much to Grandpa Mike and Grandma Pat. And Abigail’s birthday is this weekend. We already have one incredibly heavy box that requires extensive construction. This entry was posted in Abigailia and tagged Instructions, Sandbox. Bookmark the permalink. I would have paid to have some of this construction on YouTube to watch. Spoiler alert: It’s Abigail’s birthday this weekend. This has been a test of who could make it down to the last paragraph. Since the comments appear below the post itself, I’m not sure your gambit will work.